Inspiration for a creative project is a funny thing. They come in many shapes and forms, they can be instantaneous, developed, or spontaneous. Sometimes your “Ah ha!” moment can be right in front of you. 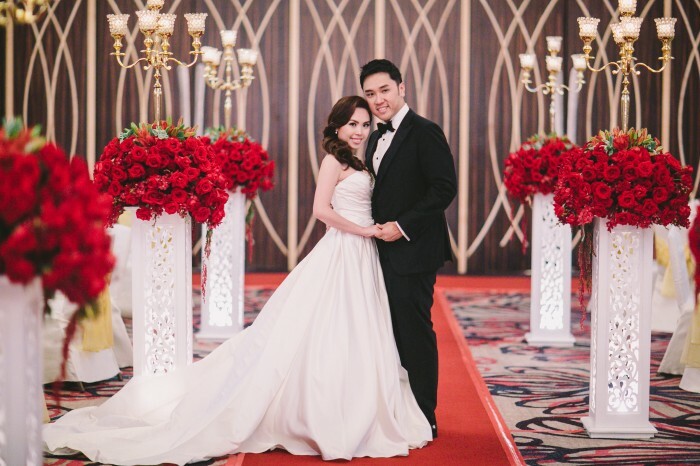 For our couple’s Kuala Lumpur wedding reception they found theirs in Sze’s evening gown! 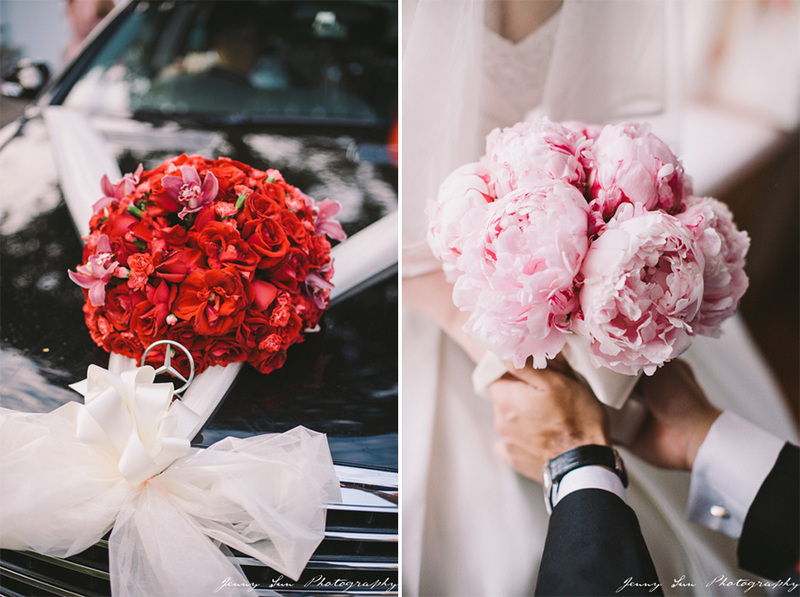 Let’s check out their wedding event captured expertly by Jenny Sun Photography. Our bride, Sze, is ravishing in a custom-made gown in red and gold. 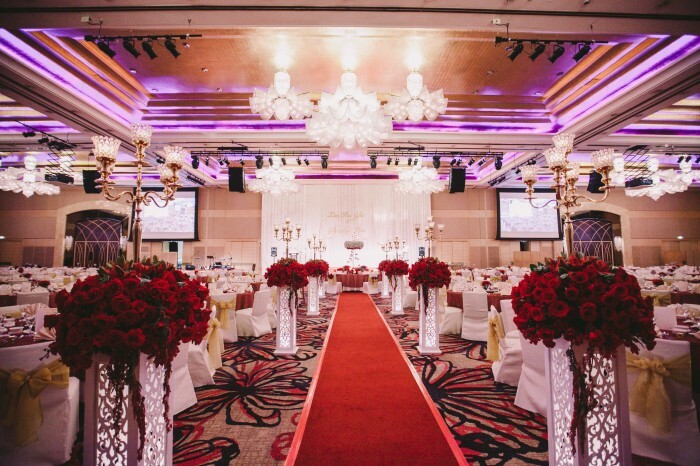 “We had a modern ceremony in Melbourne, in blush and grey tones,” says Sze, “so for our Malaysia ceremony we went with a traditional one, as a sign of respect to our parents and to our family roots.” This led to our bride’s choice for an Oriental red evening gown, embroidered with gold threading, and became the inspiration for their wedding colours. Fresh, luscious, gorgeous blooms for the big day. She added, “We only met Lily several months later when we were back in Malaysia, and it proved to be our best choice for the wedding.” Thank you so much Sze and Pei Yee for placing your faith in us! 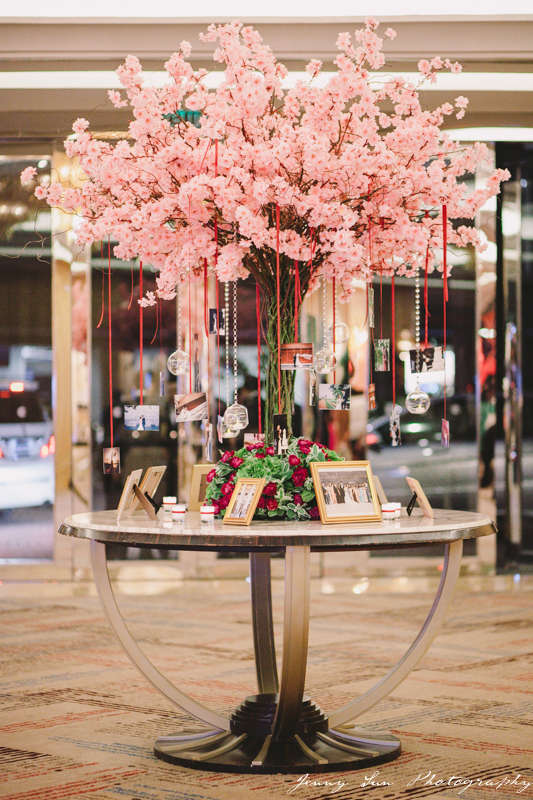 The wishing tree’s graceful presence set a lovely atmosphere in the foyer. 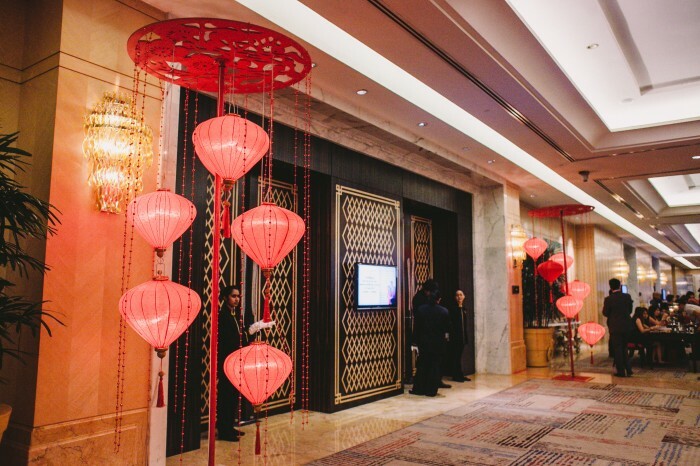 The Chinese lanterns requested by our couple, light the way to the wedding venue. Custom-made “PS” sign and custom-made photobooth backdrop for our couple. As requested, we created for our couple a photobooth background decorated with the Double Happiness sign. We used a neutral colour for this as the “PS” signage and oversized, handmade paper flowers were already in red. 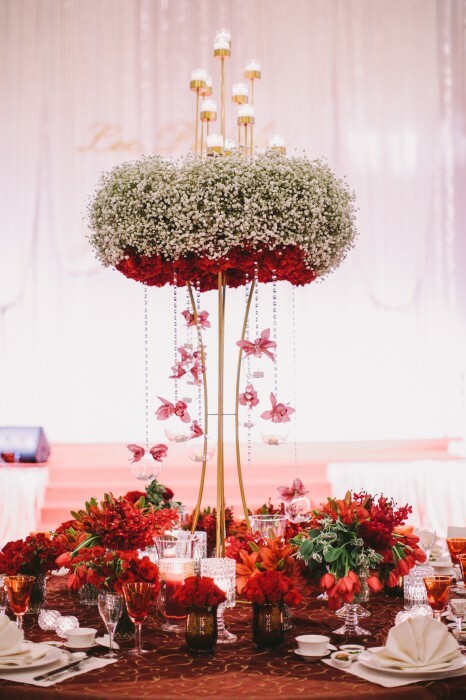 They were one Sze and Pei Yee’s favourite parts of their wedding decor! A red carpet entrance for Sze and Pei Yee. Deep red accents in the form of gorgeous, fresh blooms. 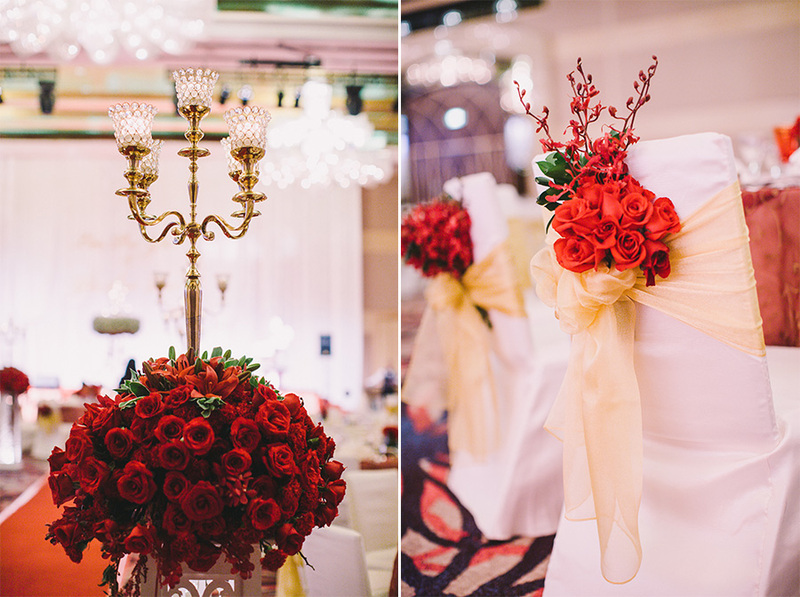 Beautiful reds with accents of gold and crystal, fill the bridal table with warmth and romance. Close-up of some of the blooms and accents on the bridal table. 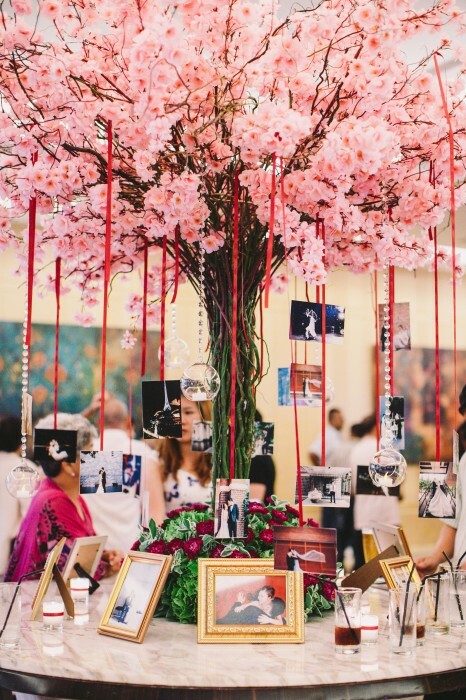 A close-up of another one of Sze and Pei Yee’s favourite wedding decor ideas. Our lovely couple share a quiet moment between the rows of gorgeous roses. We want to thank Sze and Pei Yee for being so wonderful to work with, and especially for sharing their big day with us and our readers on this blog. We wish you all the best on your life journey together!